But this image failed AGAIN to materialize on cue! Instead of this ending I awoke this morning to its polar opposite which is much older than the nightmare above. Our interior-lives speak to that inside us all which comes from the depth of wonder in the human spirit as it is expressed in the sheer beauty of the world we were each born into, to live and to enjoy. There are eleven musical-chapters in this pictorial response, in five languages. This speaks of the beauty and wonder most of us came with. If you listen while you read this you’ll know that the Four Horsemen and their nightmares can be banished. The Apocalypse was created to captivate us all ­ in the Old Testament, thousands of years ago ­ but that can only happen if you buy the obscenity of the overt physical FEAR & TERROR which the seven-foot-circle above was mentally created to instill: RESIST them! “CONQUEST - His upper body is armored in gold & silver but in his left armpit the symbol of chaos is born. His right shoulder guard is feminine and in the corrosion of the left guard rests the masculine. The stone glove that carries the flag brings a volcano in mid-eruption. The massive armor seems impressive but it's too heavy and too thick to allow to the figure to exercise its full potential, in fact he cannot bend the arm that holds the bow, and his grip upon symbolic power prevents him from using the bow for anything but show. WAR - His shield is decomposing from the heat of the destruction of the Flag of All Nations. As in life, this invalid shield is being dissolved from the bottom up. The hilt of his weapon is made from the severed head of an Eagle. 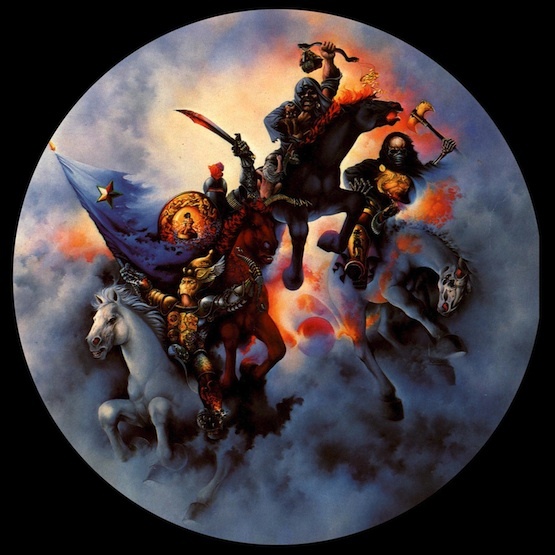 But the key to his destruction lies in the three clenched fists that forever-blaze atop his helmet and represent the chaos that War always hurls among the nations. DEATH - This figure has always been a major part of Life. His cloak is held by a golden sundial that indicates the value that his presence lends to Time. A pair of Egyptian Funeral Vultures decorate his breast-plate, and his shin guard carries a totem image of Ancient Egypt's Four-Most-Important things. His upturned boot reveals the hated blade that comes with violent endings. The face-plate for his horse is made directly from the skull of his trans-parent mount, but Death's presence is constant in all that everyone must undergo so there will always be a physical end to everything that humans undertake, including all of Cheney's WARS! The Four Horsemen of the Apocalypse are in reality just an ancient-illusion of false-power that was meant to overwhelm ordinary people into believing that their supposed powers were absolute and can never be defeated. That’s a lie! Compare the imagery in the first video that offers parts of the actual reality which the Horsemen were initially-created to abolish. The human imagination is massively complex, filled with questions and beliefs. When we live our lives with imagination we can reduce these exaggerated-nightmares into manageable parts of the larger life of the planet. Just as death is a natural-part of life: So too are the other horsemen of the Apocalypse. These imaginary-figures are just aberrant extremes of the many complex-aspects that have haunted the human race since we first began to walk. CONQUEST can be globally contained. WAR can be branded as the criminal action it always has been. FAMINE can be abolished if and when we use natural resources as they were meant to be used. DEATH is beyond our control, as part of life, but ‘death’ need not be allowed to remain as the most common part of Conquest, War and Famine—as it is now. NOTE: Ironically when I searched, just now, for the article ‘AGAIN & AGAIN’ I discovered that the original oil-painting is now for sale for $30,000.00 on E-Bay. By California law there will be a percentage of the sale price due me; yet no one has bothered to contact me about the availability of my original art and I’m not really that hard to find on the internet.